The pictorial definitive Iceland stamps of this period finally replaced the portrait-type or single-design-type definitive postage stamps of the past. 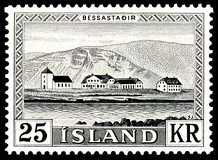 The new pictorial definitive postage stamps would eventually have variable designs, and they would feature subjects of importance to the Icelandic people, such as their history, their culture, and the beautiful scenery of their island nation. 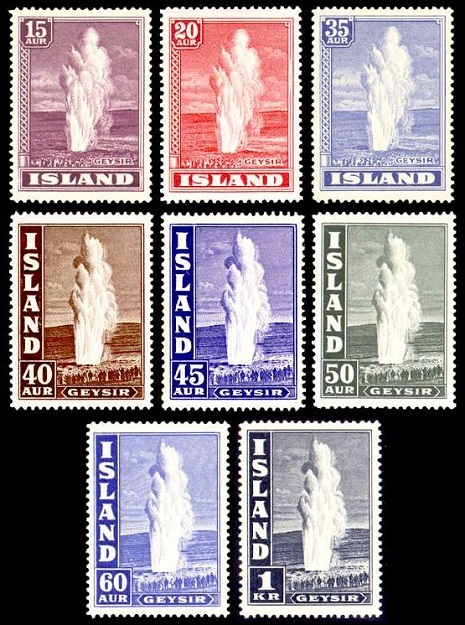 The eight pictorial definitive Iceland stamps shown above were issued between 1938 and 1947. These stamps are all engraved. 15 A. (1938 - Sc. #203) - Deep Rose Violet. 20 A. (1938 - Sc. #204) - Rose Red. 35 A. (1938 - Sc. #205) - Ultramarine. 40 A. (1939 - Sc. #206) - Dark Brown. 45 A. (1940 - Sc. #207) - Bright Ultramarine. 50 A. (1938 - Sc. #208) - Dark Slate Green. 60 A. (1943 - Sc. #208A) - Bright Ultramarine. 01 K. (1945 - Sc. #208B) - Indigo. 60 A. (1947 - Sc. #208c) - Bright Ultramarine. 01 K. (1947 - Sc. #208d) - Indigo. 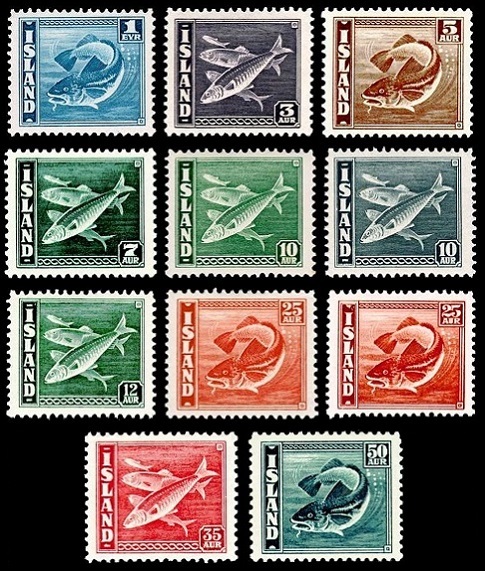 The eleven pictorial definitive Iceland stamps shown above were issued between 1939 and 1945. These stamps are all engraved. The two common designs of these fishing-themed definitive stamps feature a Codfish and a school of Herring. 01 E. (1939 - Sc. #217) - Prussian Blue. 03 A. (1939 - Sc. #218) - Dark Violet. 05 A. (1939 - Sc. #219) - Dark Brown. 07 A. (1939 - Sc. #220) - Dark Green. 10 A. (1939 - Sc. #221) - Green. 10 A. (1945 - Sc. #222) - Slate Gray. 12 A. (1943 - Sc. #223) - Dark Green. 25 A. (1940 - Sc. #224) - Bright Red. 25 A. (1945 - Sc. #225) - Henna Brown. 35 A. (1943 - Sc. #226) - Carmine. 50 A. (1943 - Sc. #227) - Dark Blue Green. 01 E. (1939 - Sc. #217a) - Prussian Blue. 03 A. (1939 - Sc. #218a) - Dark Violet. 05 A. (1939 - Sc. #219c) - Dark Brown. 10 A. (1939 - Sc. #221b) - Green. 25 A. (1940 - Sc. #224b) - Bright Red. 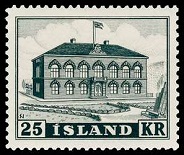 The pictorial definitive Iceland stamp shown above was issued in 1939, and the design features the Flag of Iceland. 10 A. (1939 - Sc. #228) - Carmine & Blue, Carmine & Ultramarine. The three high-denomination pictorial definitive stamps shown above were issued between 1939 and 1947. These stamps are engraved. The common design features a statue of Thorfinn Karlsefni. The original is located in Philadelphia, and a copy is located in Reykjavik. 02 K. (1939 - Sc. #229) - Dark Gray. 05 K. (1943 - Sc. #230) - Dark Brown. 10 K. (1945 - Sc. #231) - Brownish Yellow. 02 K. (1947 - Sc. #229a) - Dark Gray. 05 K. (1947 - Sc. #230a) - Dark Brown. 10 K. (1947 - Sc. #231a) - Brownish Yellow. 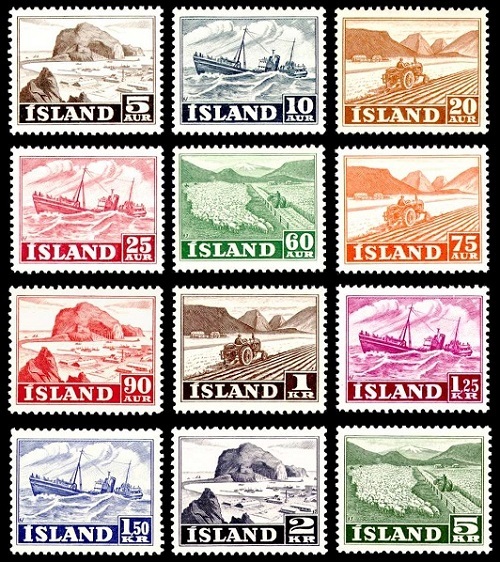 The twelve pictorial definitive Iceland stamps shown above were issued between 1950 and 1954, and they feature Icelandic Vocations and Scenery. 05 A. (1954 - Sc. #257) - Dark Brown. 10 A. (1950 - Sc. #258) - Gray. 20 A. (1950 - Sc. #259) - Brown. 25 A. (1954 - Sc. #260) - Carmine. 60 A. (1950 - Sc. #261) - Green. 75 A. (1952 - Sc. #262) - Red Orange. 90 A. (1950 - Sc. #263) - Carmine. 01 K. (1950 - Sc. #264) - Chocolate. 01.25 K. (1952 - Sc. #265) - Red Violet. 01.50 K. (1950 - Sc. #266) - Deep Ultramarine. 02 K. (1950 - Sc. #267) - Purple. 05 K. (1950 - Sc. #268) - Dark Green. The 25 K. denomination pictorial definitive stamp shown above, at the left (Sc. #273), was issued on April 1, 1952. The design features the Parliament Building. The 25 K. denomination pictorial definitive stamp shown above, at the right (Sc. #305), was issued on August 1, 1957. The design features Bessastadir, the residence of the President of the Republic of Iceland. Geysir, or the Great Geysir, is a geyser in the Haukadalur Valley in Southwestern Iceland. Geysir was the first geyser described in a printed source, during the 18th Century, and it was the first geyser known to Europeans. 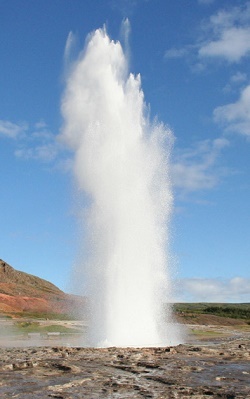 The English word "geyser", meaning a "periodically spouting hot spring", is derived from the Icelandic word "geysir". The Icelandic word "geysir" is derived from the Old Norse verb "geysa", meaning "to gush". Geysir and other geysers in the Haukadalur Valley are the most popular destinations for tourists visiting Iceland.